“At a time when higher education has never been more demonstrably important and also under attack, it’s important that we center around our core mission,” said Chancellor Patrick Gallagher in his opening remarks about education at the 2018 Senate Plenary, Teaching Today, for Tomorrow. The annual assembly of Pitt’s official body for shared governance addresses a topic of importance for the academic community. Previous plenaries have discussed the role of research metrics in faculty evaluations, academic freedom and digital technology in education. 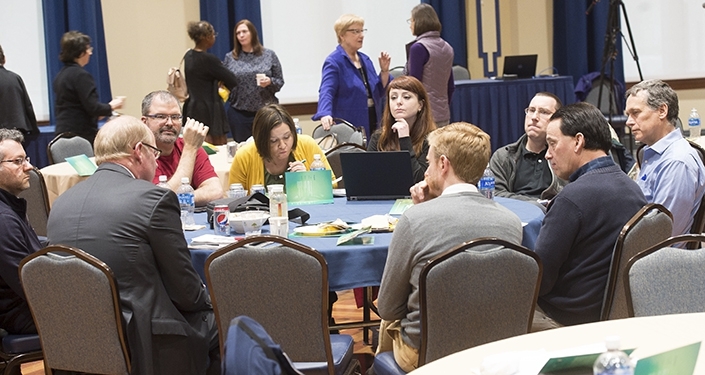 This year, students, faculty and staff gathered to hear from Pitt faculty and administrators on the necessary changes in teaching styles, and ways to talk and think about teaching in a time of a data science revolution, noted president of the University Senate Frank Wilson. 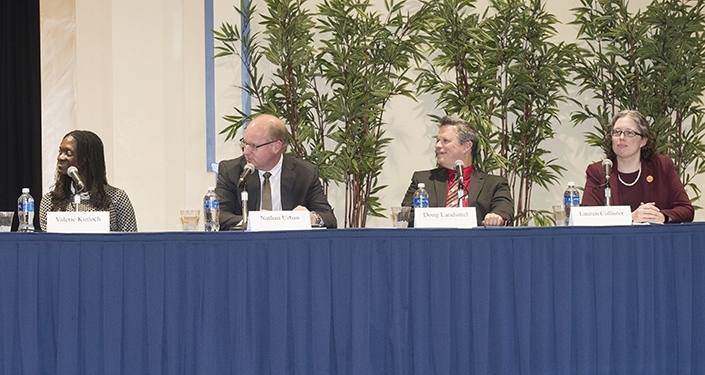 The talks took place in the Assembly Room of the William Pitt Union on Tuesday, March 27. Presentations were chock-full of references and resources, which can all be found on the University Senate website. Those who missed the plenary can watch it here. What follows is a summary of the talks. In her presentation, titled “Remembering the Past, Taking Note of the Present, and Conceptualizing the Future of Teaching in Higher Education,” Valerie Kinloch, the Renée and Richard Goldman Dean of Education in the School of Education, relived a formative moment with an early mentor. Over a meal at a community center in Columbus, Ohio, Kinloch and her mentor had been talking about teaching. Kinloch played part of the recording: “I think that there is nothing more admirable, more worthy of praise, than teaching. There really isn’t,” her mentor had said. Kinloch recalled getting goosebumps. It was a cemented realization that every moment is a teaching moment, that teaching happens all the time, everywhere, she said. “Conceptualizing the future means thinking about the stories that are present in front of us every day that we do not account for,” Kinloch continued. While walking past colleagues and students on campus each day, she said, she takes stock of all the faces she sees, and wonders about the ones that are missing, and why. “Teaching Today, for Tomorrow” is so relevant because the playing field is inherently unequal, she said. “I think that we know we need to implement a few things” to address some of the challenges facing higher education today, she said, including supporting teaching and non-tenure stream faculty, enhancing access and affordability to higher education and establishing community partnerships. Each year, thousands of freshmen come to college undecided about their major or career path. It’s the responsibility of people more familiar with universities to help them navigate their way there, he said. In some ways, Urban said, the Personalized Education Initiative is “old news,” having launched through the provost’s office in 2016. So “what makes this relevant now?” he asked: Student expectations are changing to fit an increasingly tailor-made world. By centering the student, the Personalized Education Initiative (PEI) is designed to further the fostering of learning in and outside of class, through curriculum and advising, all with the goal of helping students leave the University confident in their set of skills to lead lives of impact. “We have the opportunity through data to do this in a more sophisticated and effective way. Immersion is key for student success,” Urban said. Already, the PEI is helping to better understand and match students with opportunities; enhance coaching, advising and mentoring; and develop new opportunities to engage the campus as a whole. “We’re in a great position as a large University with a large research focus to be an incredible environment for our students, to personalize their experience,” Urban said. Indeed, all the talk of changing the current models of education sounds magical, noted Douglas Landsittel, a professor of biomedical informatics, biostatistics and clinical and translational science in the School of Medicine. But, “there’s no magic wand,” he said. 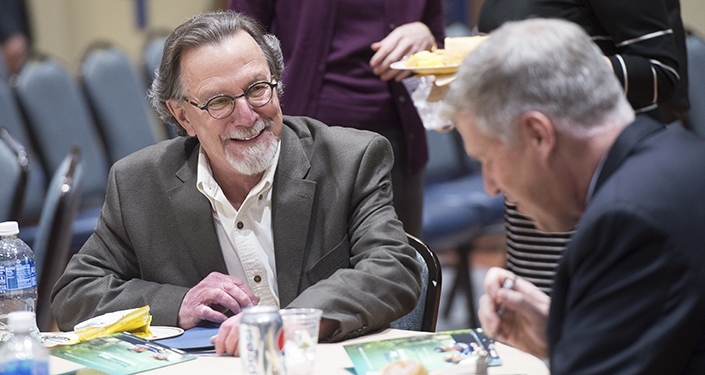 Landsittel, who has been teaching undergraduates since coming to Pitt about 30 years ago, is a statistician and the co-chair of the Senate educational policies committee. On top of the ubiquitous demand, student knowledge really runs the gamut, he said, which makes for an interesting case study in teaching — his topic of conversation at the plenary. The traditional “sage on a stage” teaching model has been shown to be less effective than other active learning approaches such as flipped classrooms and massive open online courses, for instance, he explained. Many institutions, including Pitt, are already successfully flipping the script. The University Center for Teaching and Learning has been hugely successful, as well as the Pitt Course Incubator, Landsittel said, and the annual Innovation in Education Awards are competitive. He stressed that implementing new models of teaching takes time and a team, and one size does not fit all. But experimenting is “a key action item” that will help guide the University through its mission to advance educational excellence, he said. Lauren Collister, a scholarly communications librarian at the University Library System, talked about one way to level the playing field: Open Educational Resources (OER). The high cost of textbooks is a huge barrier to education for a lot of students, Collister said. It’s one of the “invisible costs” that come with college — spending that students often can’t budget for, since textbook editions often aren’t assigned until the syllabus is handed out on the first day of class. “It’s a bad situation when students have to go into additional debt or undercut their own education by going without,” she said, pointing out the direct relationship between student success and textbook cost. Open Educational Resources can help. These resources can be all kinds of things, including textbooks, Collister explained. OER are sometimes met with hesitation from instructors — “You get what you pay for, so if they’re free they can’t be good.”; “Are they even peer reviewed?” and “Where can I find a good one?” — but Collister’s guide can help with that. Librarians can counsel or answer questions, she said. She suggested that faculty consider incorporating the cost of OER into future teaching grant applications. The federal government funded open textbooks in the new spending bill, and there may be grants in it, Collister said. When the Student Government Board passed its resolution to adopt OER at the beginning of this year, the administration listened, noted Senate President Frank Wilson; this year’s plenary topic reflects that.